Is there one eternal now that exists everywhere, throughout all of reality, in this universe, and all the other universes of the multiverse? Is time just the 4th dimension? Does the first three dimensions move through a fourth? Does time actually exist, or is it just an illusion? Why and how do we feel time? If something has been ticking since the Big Bang, what is that tick? Is time mental or physical? Will time stop if the average temperature of the universe reaches 0 degrees Kelvin? Is time just change? The motion of atoms, the turning of the Earth, our orbit around the sun, the unfolding of existence since the Big Bang? Is the astronaut traveling near the speed of light, 300 hundred years ahead of us, time traveling? How could two twins move into two different nows? Is the now of this space-time different from the now of another space-time universe somewhere else in the multiverse, or is there one universal now in all of reality? Are the past and future illusions? Is there a beginning or end of time? Are there beings that see all of time at once, as if we’re looking across a vast three dimensional space? Is there anything outside of time? Would time exist without us? Is it possible to have two nows? If there is only now, does it matter what time it is? If we didn’t measure time would we think it existed? 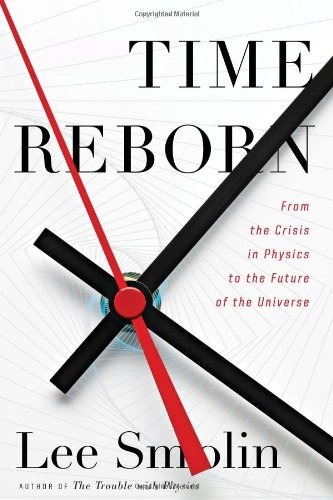 Time Reborn by Lee Smolin, is a book about physics by a physicist who makes a scientific case for time to be real, and what that means philosophically and for physics. If you are not a physicist, or a fan of popular science books, I’m not sure if I can recommend this book to you as fun reading. It is hard to comprehend all the subtle implications involved with the physics of time. However, if you have a philosophical bent, it might be worth considering. Smolin is making a case that time exists, that it has a direction, and that reality is evolving. Classical physics always models the universe in mathematics, and quite often time either doesn’t exist, doesn’t matter, or the equations work regardless of the direction of time. Ever since Einstein, scientists have searched for a grand unified theory of everything, hoping to find elegant equations that explained reality. Smolin rejects this goal by making a case that the universe can’t completely be described in mathematics. To the average person, with common sense, they will reply, “Duh!” Isn’t it obvious that time exists. Isn’t obvious that time has a direction. Isn’t it obvious that mathematics can’t explain everything. Our everyday reality is very far from Big Bang cosmology and quantum physics. Physicists are trying to explain everything, and often it’s easy to ignore the immediate world. When you’re number crunching complex equations to explain reality it’s easy to think time can be ignored, or even space. But black box simulations of the universe aren’t modeling the real universe. It’s hard to know exactly what Smolin is saying because he gives us so many possibilities to consider, but the epilogue suggests why he wrote the book, to make a philosophical statement. What I got out of the book might not be what Smolin intended, but here’s how I read him. Smolin wants us to accept time. He wants us to reject the siren song of the timeless. He warns us to be wary of timeless concepts of the universe, whether it’s religion, whether its a mathematical expression, whether it’s a simulation, or even Platonic ideals. Mathematics can approximate some features of the universe, models can simulate some features, but ultimately, people like Max Tegmark and Juan Maldacena are wrong. And reality is neither a creation of God or solipsistic dream. If time is real, and the universe is evolving, either from the Big Bang, or earlier causes in the multiverse, and there is a universal now, with a past and a future. Smolin doesn’t say it directly, but reality isn’t about us. He’s against the anthropomorphic principle. Realty would have existed without us. We just accidently happened to evolve in a universe that is suitable for life – it wasn’t created for us. Ultimately, there are limits to what science can see or detect, and to understand. We can’t know why there is something rather than nothing. We have a lot more we can learn about this universe, and we may even learn something about the multiverse, but the ultimate cause of existence is probably beyond physics. To say that time exists does not mean we can prove time origin and end. That’s the problem with humans. Our religious and philosophical natures want timeless answers to the big ontological questions. Physicists want timeless equations to explain everything. The implication is, if time really exists, then timeless answers don’t. Ever since I’ve finished this book I’ve tried to meditate on time. To slow my thoughts and focus, hopefully to catch the ticking of time passing. But I can’t. All I can do is notice the slightest changes of things around me. I feel if nothing moved, time would stop, but there’s always something moving. We live in an eternal now. We have no recollection of events before our existence, nor will we be aware of things after we’re gone. We can only be here now. Haven’t read it, but it looks interesting. Good review of a good book. You captured how I felt about the book better than I did. Smolin demystifies time. As you say, Tegmark, et. al. are ultimately wrong when they mystify time. (They’re trying to make time Platonic and appealing to some kind of God in the process.). Dennet’s book on Consciousness demystified consciousness for me. Both books changed the way I think (but I could fully recommend Dennet because it is a dense book and can be hard to get through). I read an interesting review in the New York Review of Books. The book was on Frenkel’s “Love and Math” and the review was written by Jim Holt. He acted like he liked the book, but there’s no way he understood it and he danced around the complex math in the book. But, he did criticize Frenkel for his Platonic stance (Holt can understand the philosophy, but there is no way he understood the math in that book because it was very complicatedly presented). He dismissed Frenkel’s (and by implication, Tegmark’s) view that math lies outside of the universe by saying that would mean math is a miracle and that miracles aren’t true. I thought that was very insightful for Holt to say that. I put the Dennett book in my Audible cart this morning, trying to pick just 4 books to get the $10 bonus. Then I listened to the sample of Dennett’s book on Darwin, and swapped it out instead. Now you make me want to swap it back for the one on Consciousness. Two of the others are books I picked from your reviews. The fourth is a SF novel by Charles Stross. I haven’t hit the commit button yet. I just checked, and I do have a first edition of Consciousness Explained, so maybe I’ll keep the Darwin book, and read the other. Was it Nietzsche who said we also need to be atheistic to Plato too? I can understand the historical appreciation of Plato, I just can’t understand why modern thinkers still believe his ideas. I’m still trying to wrap my head around a now that exists everywhere in reality. I just let my subscription to New York Review of Books lapse. I wonder the last issue I have has that review. You made a wise choice on swapping. His consciousness book is a tough read. His Darwin book is not a tough read and should be read by everyone. It is that good. I stumbled on to the NYR of books accidentally and sort of loved it. The price seemed steep for me (and I knew you subscribed) and with their free part of their site, I did google searches based on the reviewer and title and read the review for free. I read Holts review after I had read the book, and know he must be a friend because there is no way he would have gotten past the math (IMHO). I should have finished the thought. In the same token, time doesn’t necessarily lie only outside of the universe. As Smolin does he brings time back into our universe where it belongs and is not a miracle. I’d like to believe there is a time for the whole shooting shebang, whatever that might end up being. I call everything, reality, because it appears the term, universe, might be too limiting. It really does hurt the head to imagine space-time, time dilation, and the multiverse all at once.